I love doing this comic. I really do try to have content, twice a week, every week. I keep a list of ideas and bounce thoughts off my friends and family all the time. Idea List: Cats wearing monocles. Used-cat salesman? What if dogs could vote? 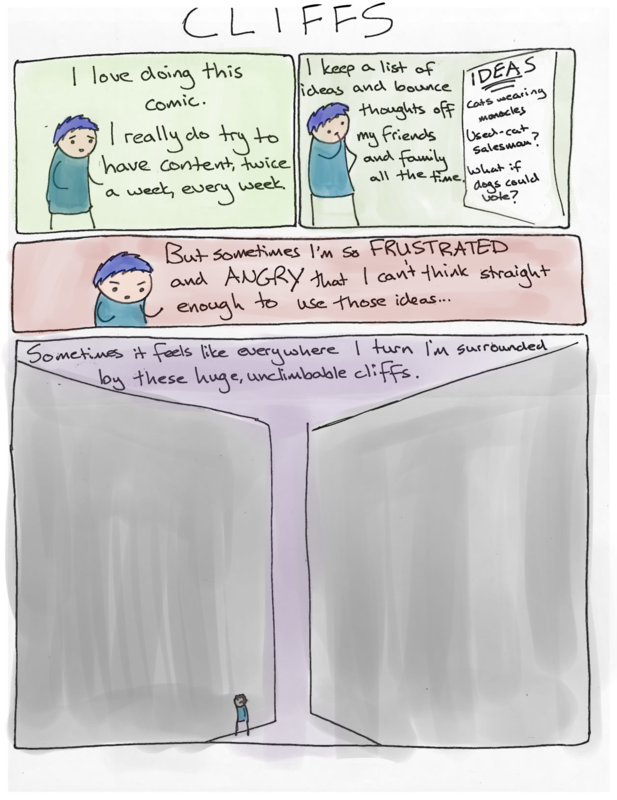 But sometimes I'm so frustrated and angry that I can't think straight enough to use those ideas. Sometimes it feels like everywhere I turn I'm surrounded by these huge, unclimbable cliffs. This is going to be a three part comic, and it’s going up Wednesday, Thursday, and Friday this week. I drew this away from my computer, so this is a bit of a new format. This series deals with no small anger and frustration, and references attitudes and events (such as the California shooting) that some may find challenging or triggery, so if you’re having a rough day you may want to consider revisiting this later I guess. But sometimes I’m so frustrated and angry that I can’t think straight enough to use those ideas. Sometimes it feels like everywhere I turn I’m surrounded by these huge, unclimbable cliffs.